About a year ago, the topic of seitan came up with a friend, and she mentioned a YouTube video on making seitan in a pressure cooker. Our previous attempts used the basic simmer in broth on the stove top method, and, while the results were okay, we weren’t crazy about the texture. Perhaps pressure cooking was the trick? While rather over-sized for everyday cooking, pressure canners can double as pressure cookers (but not vice versa), so I already had the necessary equipment. I just lacked the time and motivation to experiment. Our vegan barbeque experience in Portland included “psstrami,” their take on pastrami, made from seitan and served with barbeque sauce. The texture and very thin slices were great, but frankly, I thought I could do better flavor-wise in the barbeque department. With that in mind, I pulled out the canner two weeks ago to take a stab at the seitan. I more or less followed this recipe/method, except I brilliantly decided that a single recipe would not yield much, and as long as I was heating up the canner, I may as well go for a double. Though it seemed like extra trouble, I wrapped my uncooked dough in cheesecloth as suggested, locked the lid, brought it up to pressure and waited. Once depressurized, I opened the canner to find two HUGE logs of a suspiciously meat-like substance. Half pleased, half horrified, and a good dose of overwhelmed at the sheer quantity of seitan I had created, I set about the task of slicing it — some ultra-thin slices for sandwiches and some chunks for other dishes. Over the past two weeks, we’ve had seitan reubens, gumbo, stir-fry, and, of course, the barbeque seitan sandwiches (which were better than the food truck version). Gluten overload, anyone? Anyway, I’m really not sure how long prepared seitan is supposed to keep, but we have just a bit left. If it seems okay, it may make a final stand in tonight’s dinner, possibly as some kind of bbq/stir fry fusion dish. I really liked the texture of the ends and outside part of the seitan logs — very similar to what you buy in the store (usually for $4-$5 for just a few ounces). The center of the log was very dense, and while edible, was not my ideal. Perhaps smaller logs would help? A double recipe was WAY too much. Sure, I got to use it in fun, creative, and tasty ways, but we were eating seitan in some form almost every day for over a week — I really prefer more variety in protein sources, especially because beans and soy are healthier options than concentrated wheat gluten. 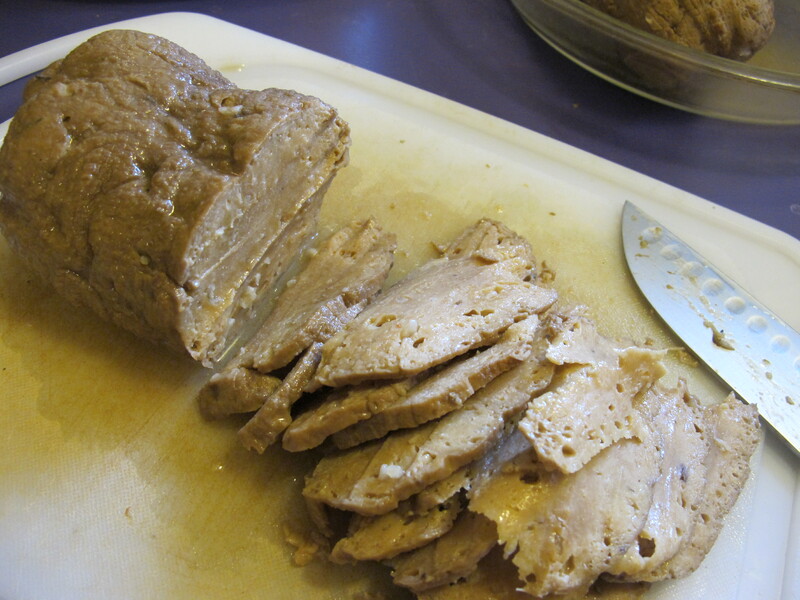 I’ll probably make pressure cooker seitan again as a single recipe with two or three smaller logs, but I’ve also seen a recipe that calls for baking the seitan in broth. Now that we’re back to oven weather, that may come first. I recently bought an Instant Pot electric pressure cooker and started looking for seitan loaf recipes and came across this post. Even though I owned a stovetop PC for over a decade I only made seitan cutlets (not a wrapped loaf) once and disliked the texture of them so much went back to making the loaves in the oven. I always make 2 loaves at a time. My husband eats seitan sandwiches for work each day, and one loaf makes 2 weeks worth of sandwich slices (He likes them a little on the thick side). I would make up 2 loaves – a month’s worth – at a time. What I do to keep them edible is unwrap them when they come out of the oven to cool a bit and the outside gets a little crusty. I then slice each loaf in half, then slice each half into sandwich-sized slices. Each of those half-loaves now goes into a quart sized freezer style zip bag and into the freezer. At the end of each week my husband then pulls another bag out so it’s defrosted enough to pry apart by the time he’s ready to make his lunch for the next day. When he pulls the last half-loaf out of the freezer it’s time for me to make more. Thanks for the suggestions, Sue. Sounds like you have quiet a bit of experience making seitan! I have heard of seitan with beet juice added, and called mock duck (like spam without the pig parts) ! Pink is what everyone is accustomed to seeing on their deli sandwich. I would do the double batch, cut one loaf into cutlets and freeze with some of the cooking broth; save a loaf as is (makes a great roast over vegies in the oven), frozen for later with the cooking broth. And if that’s still too much fresh to have on hand, cut one into chunks for stew, and again, freeze in its cooking broth. Kept nicelyin the freezer for months when I did that..